On the wild side – 2013 A flutter-by summer. With March recorded as the coldest for 50 years there was not much incentive to get cracking in the garden. 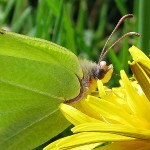 Nevertheless things were beginning to stir outside with a brimstone butterfly through the garden on the 5th March and what a welcome sight that was. Crocus, hellebore, winter flowering honeysuckle and lungwort kept the bees happy when it was warm enough for them to venture out, the latter a favourite of the hairy-footed flower bee Anthophora plumipes (a solitary bee). 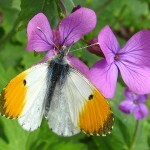 By the end of May orange tip, holly blue, peacock, comma, large and green-veined white butterflies had been noted (primrose, sweet rocket, honesty, forget-me-nots and Bowles Mauve perennial wallflower helping to provide nectar) and eggs of the orange tip found on garlic mustard and honesty. Everything was a few weeks behind and the seemingly endless cold spring continued…. June was largely cold; the winter quilt was still on the bed! 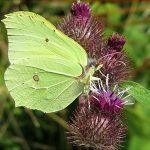 However the brimstones had been busy laying eggs on buckthorn but only a meadow brown had been added to the butterfly list. A pretty poor year so far for many insects with the knock on effect that birds had to search even harder for anything they could find to feed their young. Swift Conservation reported that swifts were dropping dead from the sky through starvation across parts of Europe. 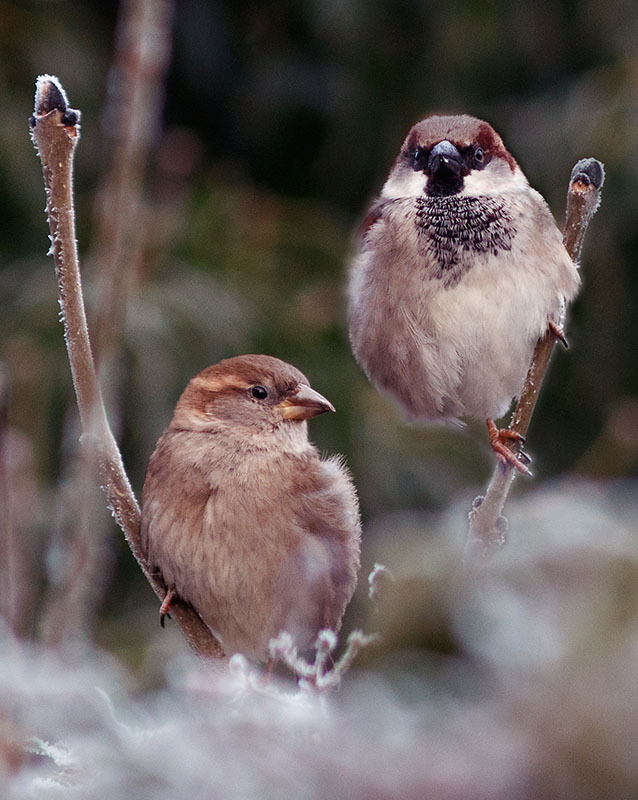 In our patch sparrows keenly searched the roses for greenfly to feed their young – a good reason not to use insecticide. 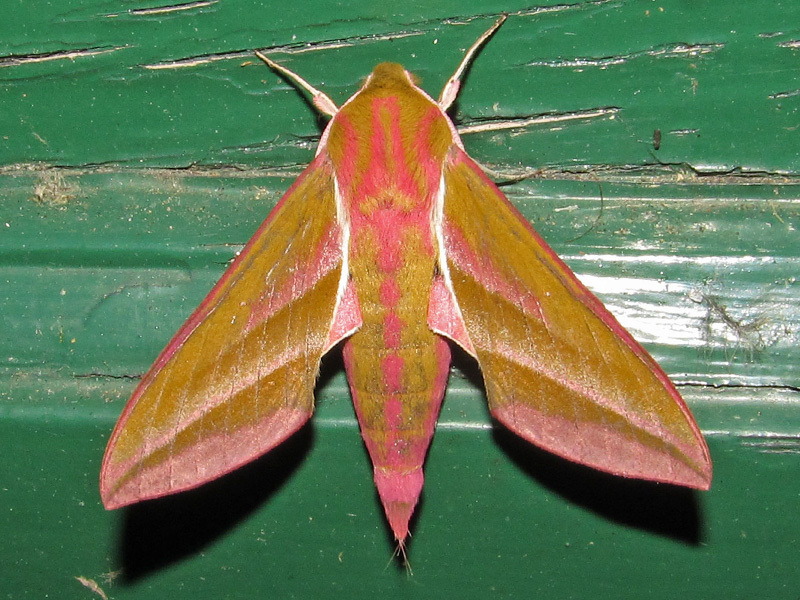 A week into July and things begin to hot up, moths with intriguing names – ruby tiger, peach blossom, elephant hawk-moth conveniently settle on the back wall under our house light and have a brief moment of fame as we turn our cameras on them. By the end of July small white, small tortoiseshell, large skipper, red admiral, gatekeeper and ringlet butterflies had made an appearance. 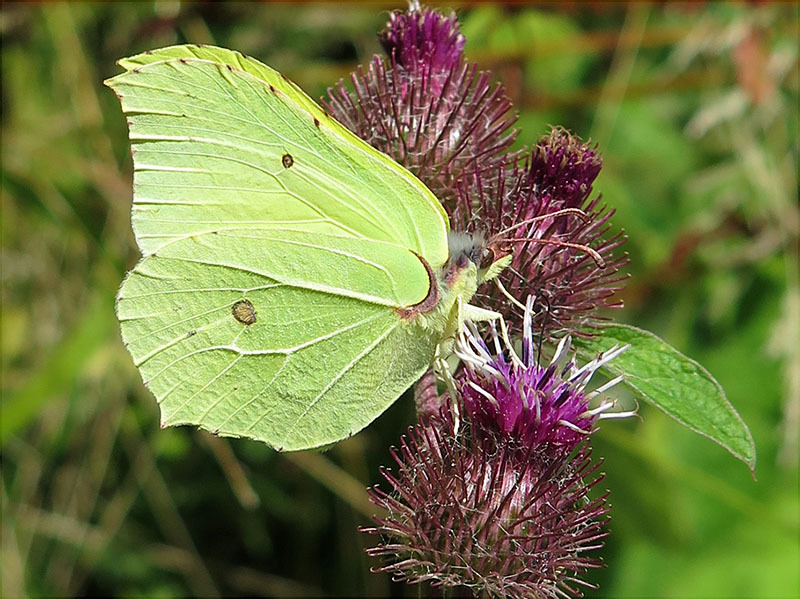 Brimstones, known for sipping nectar from runner beans and perennial pea, also used buddleia, lavender, hyssop and the lovely orange annual Tithonia rotundifolia. 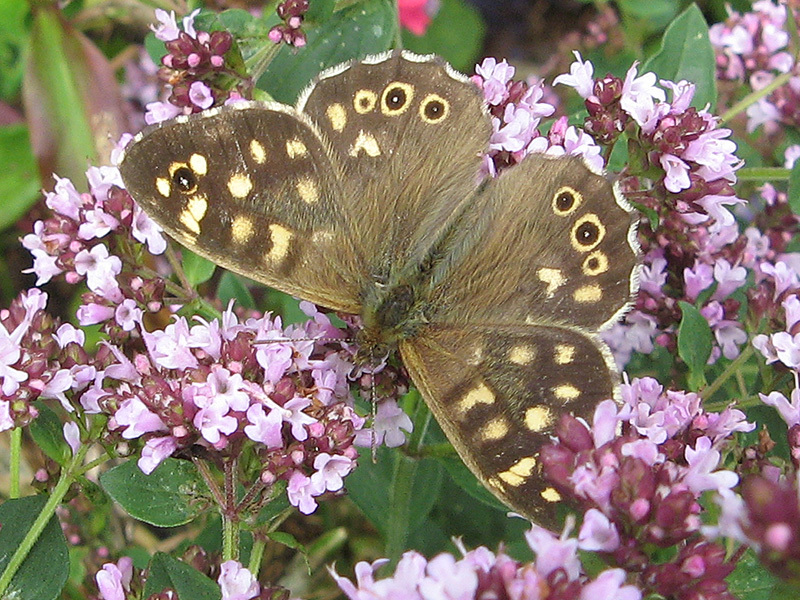 Gatekeepers with shorter proboscis preferred the large patches of marjoram – glad I didn’t reduce the size of them as intended, this plant also attracted many tiny day flying mint moths – Pyrausta aurata whose larvae feed on this and mint. Our wild field scabious is growing in completely the wrong place reaching 5 foot high in our fertile vegetable plot (there’s not an awful lot of veg.- have we lost the plot?) 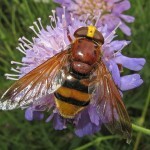 This plant is a favourite with bees, hoverflies, butterflies and moths and birds like the seed. Late night forays down the garden with a torch reveal moths on field scabious, hemp agrimony and buddleia. The garden is baked dry, no slugs or snails and the earthworms have gone deep underground. A pair of blackbirds desperately searching for food for their young are grateful for extra morsels including meaty cat food which also helps to keep 3 hedgehogs going. Topping up the bird baths and water bowls a daily task. Mid August, the weather is lovely and the garden overgrown. A huge teasel scratches us as we pass by but is attracting butterflies and bees and goldfinch will be attracted to its seed later so it stays. The Hollyhocks are so tall we can hardly see the bumblebees foraging in the flowers. 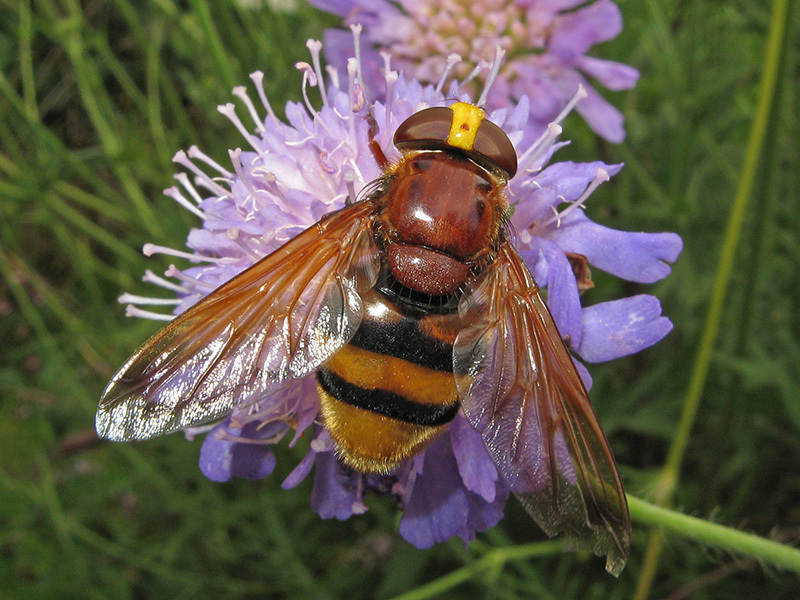 The largest hoverfly found in Britain, Volucella zonaria a hornet mimic, is attracted to field scabious and buddleia and looked mighty fearsome but like all hoverflies has no sting, is harmless to us and a useful pollinator. Only the marmalade hoverfly was seen in any numbers with 50 or so attracted to nettle-leaved bellflowers. 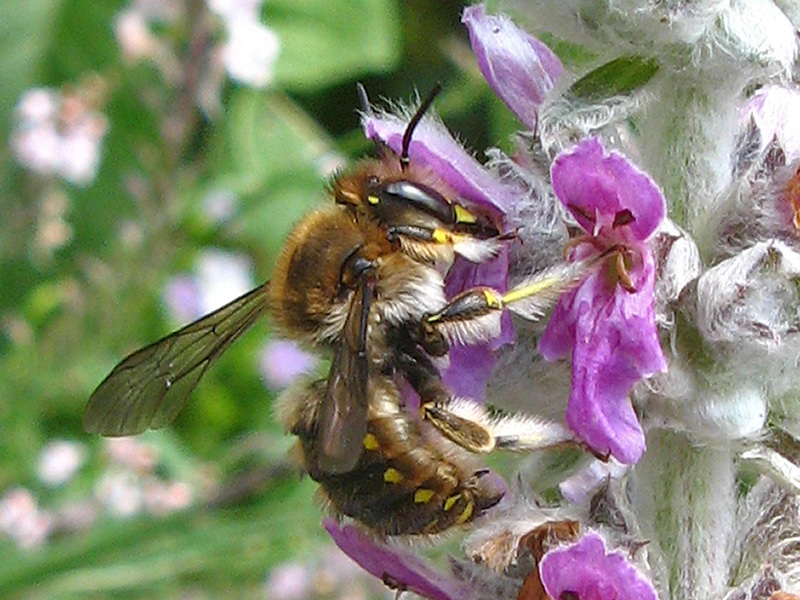 A Male wool-carder Anthidium manicatum (solitary bee) feistily patrols a patch of Wall Germander Teucrium chamaedrys in the front garden and another guards lambs ears in the back. Mesmerising to watch, they dart and hover over their territory and pounce on any other bees regardless of species wrestling them off the plants – The pouncing technique is also used to mate but the pair remain on the plant. 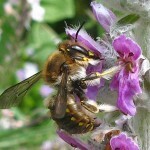 The females collect hairs from lamb’s ears Stachys lanata and other hairy plants for use in their brood cells. 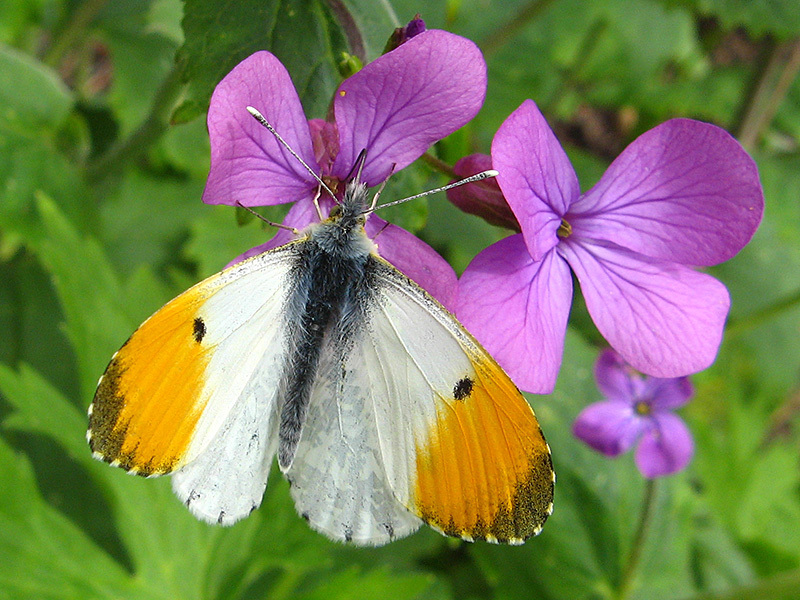 But back to the butterflies and everyone is remarking on the number and variety in their gardens. Lots of peacocks and more small tortoiseshell in our garden than for many years but numbers still way down from the highs of the early 1990’s. Whites are everywhere, dancing over the buddleia, old English lavender, and Verbena bonariensis. Single dahlias, buddleia, borage, tithonia, all good bee plants, are keeping us busy dead heading. 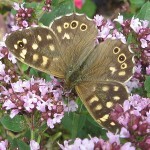 By the end of August speckled wood made an appearance and brown argus, common blue and silver-washed fritillary butterflies had dropped by, if only briefly, to take nectar. Early September and the spectacular day flying hummingbird hawk-moth arrives, zipping like lightning between flowers high up on the Beijing Buddleia, evading all attempts to get a passable photograph. 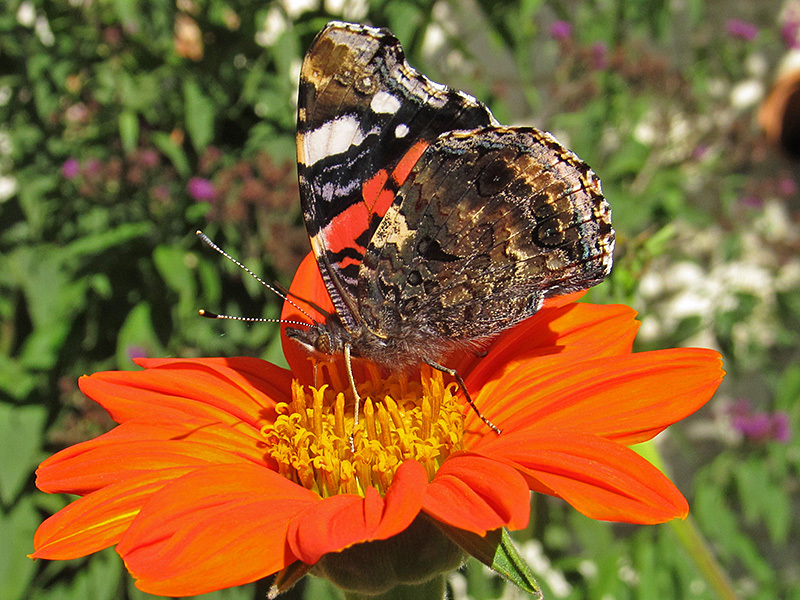 A warm autumn could see red admirals and commas attracted to Michaelmas daisies, fallen rotting fruit and ivy flowers, the latter also a magnet for moths, bees, hoverflies and wasps. 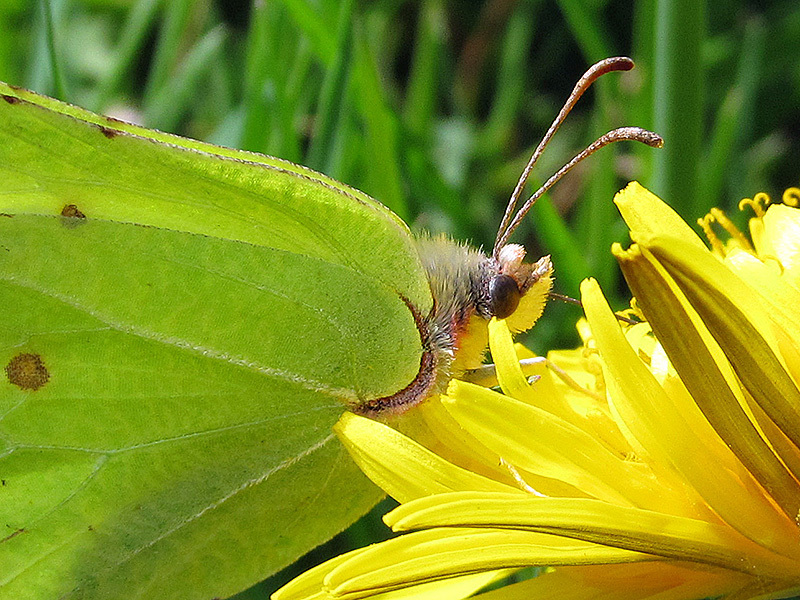 It’s been a joy to share our garden with butterflies and other creatures – here’s to next year. 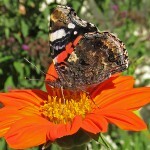 For ideas on what to plant see ‘Gardening for Butterflies’. 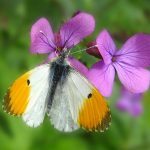 Post script: According to Butterfly Conservation, three-quarters of UK butterflies are showing a decrease in either their distribution or population levels. 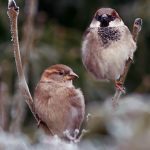 The State of Nature report 2013 reveals how all our wildlife is faring and the RSPB annually publishes The State of the UK’s Birds. 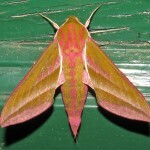 There is a wildlife gardening forum at www.wlgf.org/.